"Faith, Hope, Love...The greatest of these is LOVE" is the beautiful scripture from 1 Cor. 13 on our fabulously fragrant, Covenant silver-tone candle tin. 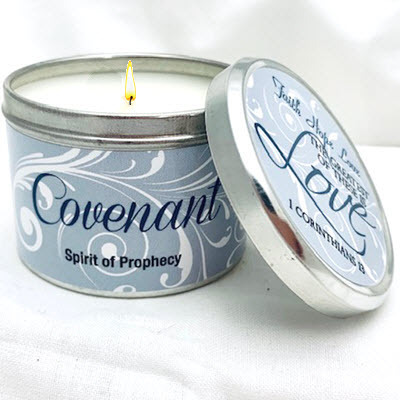 This custom blended fragrance representing covenant and true commitment of Love combined with the Word of God reminding us to walk in Love will speak volumes to all believers! This 6 oz candle makes a great gift for under $10! We have changed the name of our Ketubah to Covenant, which more accurately depicts the true biblical meaning.